Rabbi Aaron Gruman received his rabbinic ordination from the Lakewood Yeshiva, Beth Medrash Govoha. He and his wife Elkie moved to the community in 1989. Rabbi Gruman grew up in Los Angeles, where his father, Rabbi Pinchos Gruman, served as Rabbi of Young Israel of Los Angeles for over thirty years. Under his leadership, the community has grown to where it now has daily Minyanim, an Eruv, and a Mikvah, a daily Daf Yomi shiur, and weekly Shiurim. Rabbi Gruman has been an active supporter of NCSY, has taught Judaic classes at Hillel Yeshiva High School, and is the founder of Project Gesher. 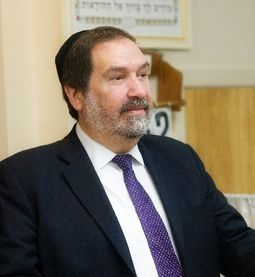 He is very active in the world of Jewish Outreach and serves as the Director of Torah Links, the outreach arm of Beth Medrash Govoha which has branches throughout New Jersey and across the country. His down-to-earth approach helps CTE create a warm and friendly community that fosters spiritual growth for Jews of all religious backgrounds. He pays particular attention to the Youth of our community and encourages their active participation in our Services and youth programs. His wife Elkie is active in community and synagogue affairs, involved with the mikvah, conducts kallah and mikvah classes, and teaches a weekly class for women. They have been blessed with six children and beautiful grandchildren who also an integral part of our community. Other Rabbis in the community include Rabbi Sruli Nadoff of Shalom Heritage Center, Rabbi Leib Miller, Principal of Shalom Heritage Center’s Hebrew School, and R'Yeruchem Katz, Rosh Kollel for the community. Each Rabbi and Rebbetzin is friendly, approachable, and available, fostering friendship and spiritual growth. We often have visiting Rabbeim and speakers, often with strong ties to Twin Rivers.